• Provides Plenty Of Mental and Physical Activity and Stimulation. • Feather Dangler Is An Irresistible Toy. 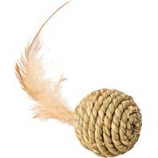 • Which Will Have Your Cat Leaping and Flying Through The Air After The Furry Feathers. 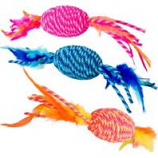 • The Wand Is 18 Inch With An Elastic String Which Hold The Furry Feathers. 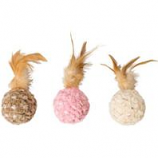 These toys are brite and colorful and contain feathers rattles and catnip.. Extra stretchy elastic cords are fun to bite and pull. . . . 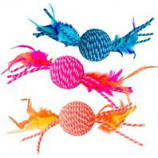 These toys are brite and colorful and contain feathers rattles and catnip. Extra stretchy elastic cords are fun to bite and pull. . . . The Classic Fur Mouse Comes In Assorted Colors The All-Time Kitty Favorite Fashioablyhued For Hours Of Playtime Fun. Super soft chenille fabric with a satiny texture. Cats will love to bat and cuddle with these. Contains a rattle and catnip. . . Perfect all natural texture to bite and scratch. Made with all natural sea grass. With enticing feathers and catnip. . . 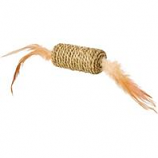 Rattle Clatter Mouse Make Sound and Contains Catnip To Attract The Cats Attention Package dimensions: 2.5 x 4 x 6. Plush Jittery Mouse It Shakes and Shivers Just Pull Its Tail Great For Adventurous Cats Package Dimensions 525 X 75 X 25. • Your Cat Will Take One Look At This Mouse and Nature Will Take Over. Rolls around while the bright orange feather moves back and forth to taunt your cat into play. Compressed hypernip thwapper toy. Proprietary blend of silvervine and catnip drives cats wild. Hypernips-more potent than catnip. 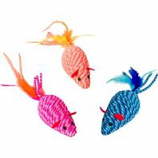 Tail made from real jute a quicker growing natural material. .
Multi-colored long hair fur mice 2 Pack, assorted. 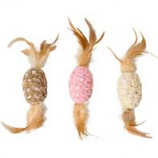 These long haired fur mice cat toy, is a perfect toy for any cat. The Fur Mouse provides good healthy exercise for hours of playtime fun.